Mesoamerican archaeologists have long been interested in the collapse of political systems or civilizations but have been slow to undertake detailed abandonment analyses of specific settlements. 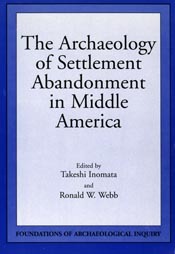 The Archaeology of Settlement Abandonment in Middle America explores some of the old questions in Middle American archaeology in light of the newer theoretical approach provided by abandonment studies. Unlike much of the abandonment work previously done in the American Southwest, a number of contributions to this volume examine relatively large population centers. Among the original contributions in this collection is the discovery that deposits resulting from termination rituals are more common than previously thought. Several chapters point out that structures and places can continue to serve ritual functions even after abandonment. Another finding is that the causes of abandonment—warfare, economic marginalization, or natural cataclysm—are likely to have varied effects on different social groups, which in turn sheds light on occupational histories in specific sites preceding major abandonments. Takeshi Inomata is associate professor of anthropology at the University of Arizona. Ronald W. Webb is program director of Latin American Studies at Temple University.